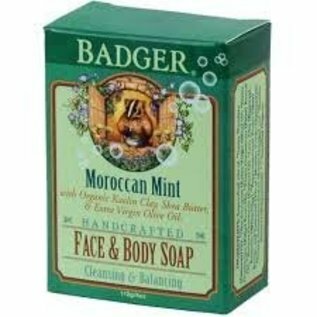 Cleansing & Balancing Badger soap is moisturizing and non-irritating, with dreamy lather and fabulous essential oil fragrances that are exceptionally good for your skin. Made in New Hampshire. Cleansing & Balancing Badger soap is moisturizing and non-irritating, with dreamy lather and fabulous essential oil fragrances that are exceptionally good for your skin. Our fabulous Moroccan Mint Face & Body Soap features mild Kaolin Clay, which gently draws impurities from the skin. The essential oil blend of Organic Mint and Citrus help to balance oil production, while cooling and refreshing the skin. This soap is exceptionally good for your face, but can be used anywhere on the body. We would never add any detergents, foaming agents, artificial "fragrance" or color, synthetic or harsh ingredients - just good clean soap!